A few weeks ago we started seeding some crops indoors and last wee kend we saw some more springtime firsts... the first harvest of the year (technically a crop from last season - leeks we overwintered under straw... they're delicious! 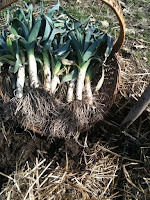 ), the first direct seeding outdoors ('hardy white' and 'deep purple' bunching onions), and the emergence of our first 2010 crop - the garlic we planted in the fall (left). 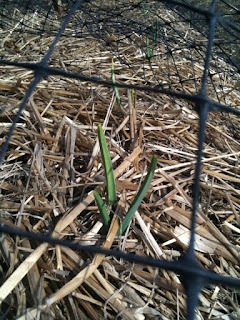 It has a long way to go; we won't harvest this until August, but I'm thrilled to see the first shoots poking through the straw. 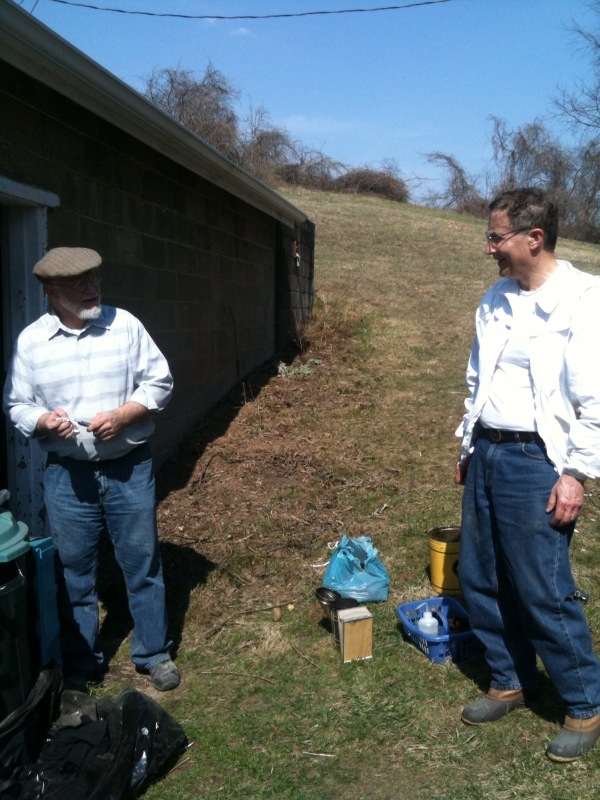 Our partners in beekeeping, Gary Marshall and Tony Indovina (the "bee guys" as I call them) came over a couple weeks ago so we could do some spring maintenance. This involves removing the overwintering wind barriers we set up around the hives, and opening the hives up so we can do a spring inspection. Everything looks great - so much so that we added a honey super to our original hive and brood boxes to the newer hives. The bees overwintered well, are producing lots of brood (new bees) and all is shaping up for this to be a season of bountiful honey harvests. 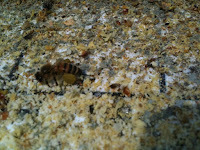 T he first harvest of the light spring honey (my favorite) will be in early June. Notice the orange/yellow stuff that looks like water wings on this lady's back legs (left)? 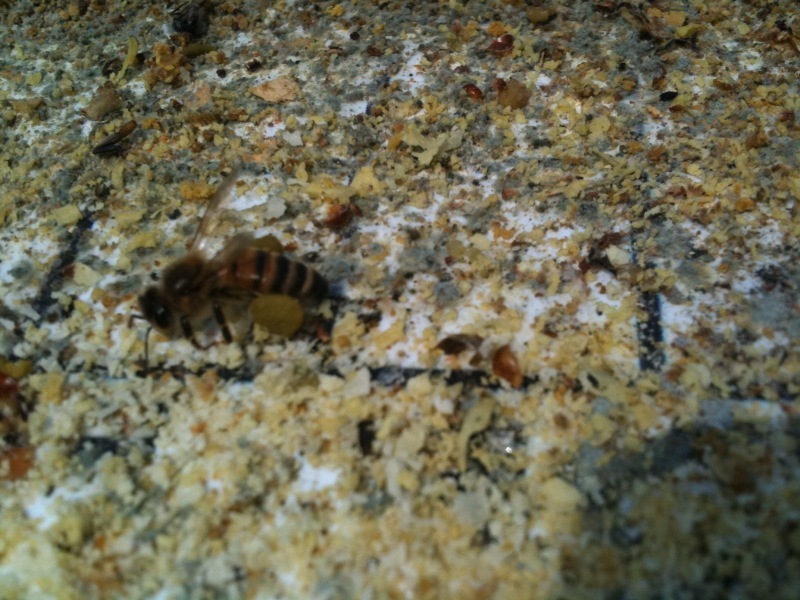 That's pollen that she's collected from some of the first flowering vegetation on and around the farm, and she's carrying it back to the hive. 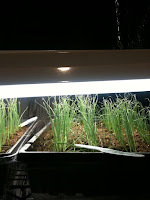 Our seedlings are doing well indoors and we've been adding new plantings every week. We're about to move some early crops outdoors to harden off, which will open up space on the shelves for the 400 + heirloom tomatoes and 300 peppers and eggplants that are still (mostly) in the germination tent (where we monitor soil temp and keep it as warm as possible until germination). 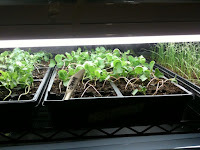 Every week we'll be starting new crops indoors and out - later in April we'll start the melons and squash inside, and I'm starting some cabbage and lettuces this week. 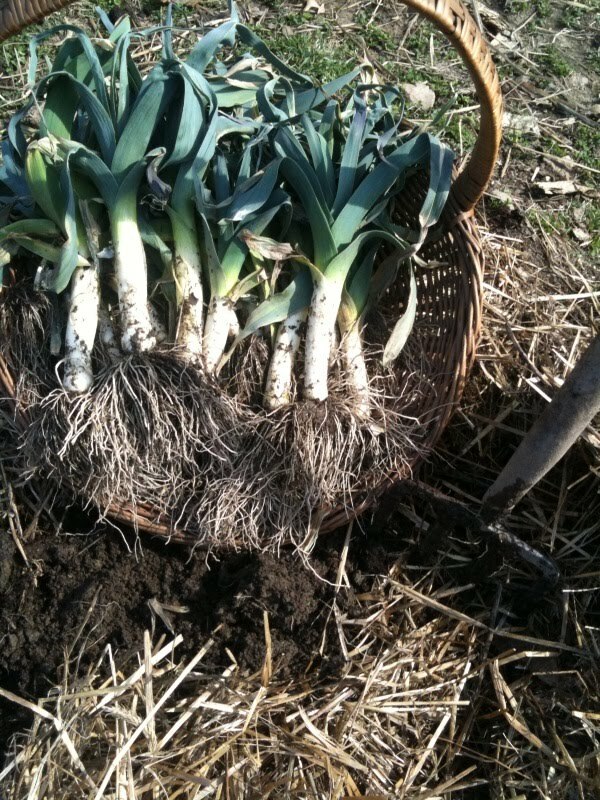 There's lots of planting going on this coming weekend - we'll transplant the kale, chard, leeks, onions and brussels sprouts that we started indoors in February, and we'll start direct-seeding beets, carrots, arugula, spinach, radish and other late spring crops that members will receive in the first weeks of CSA. 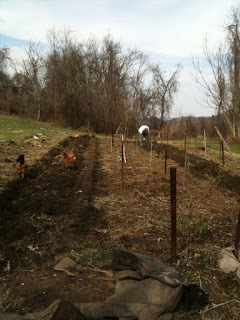 My mom, Julie and I have been hard at work with our new fabulous intern, Jess, preparing the beds for planting. 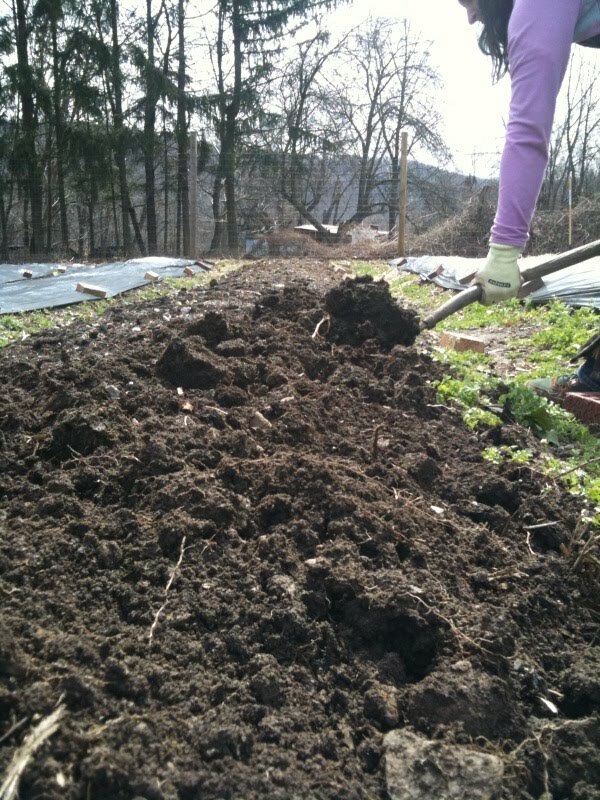 In the pic above, Julie is incorporating by hand (and fork) the composted manure we spread on the beds in the fall. 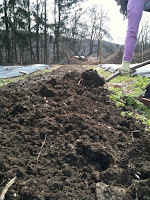 The next step was to aerate all the beds with a broadfork - no tilling here! Then we cover the beds with black fabric to heat the soil and prevent weeds from germinating until planting time, when it comes off and is replaced with straw mulch. It's a lot of work but the soil looks fantastic, and as we build it with these natural amendments, cover crops, and our sweat and careful labor, it gets better every year. 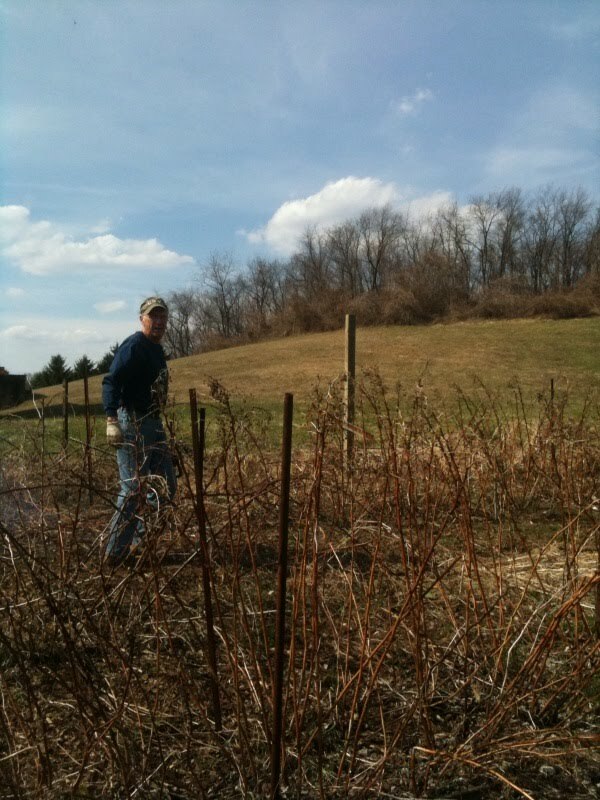 My dad has been hard at work in the berry patch (the chickens are helping) cutting down the raspberry stalks from last year and getting the rows ready for additional plants. 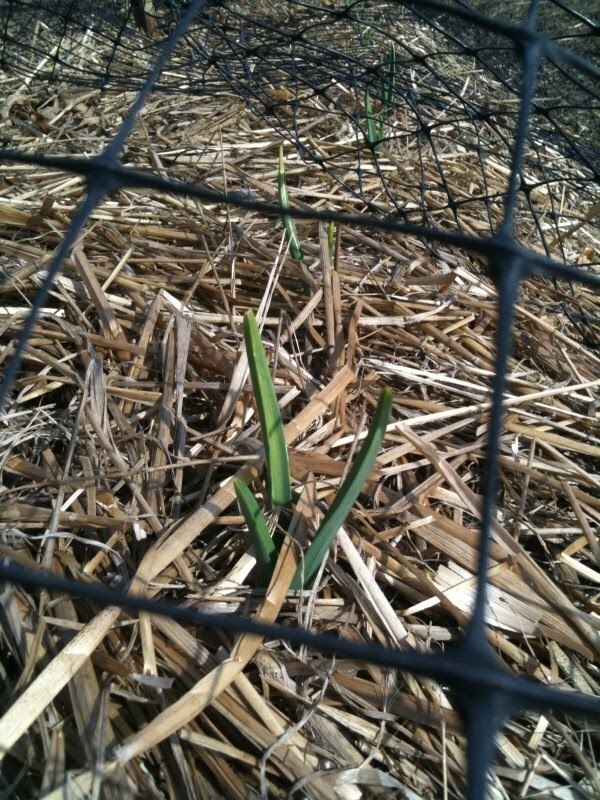 As they spread each year we transplant them to make additional rows. 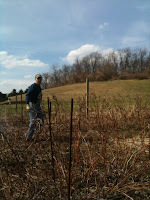 The new stalks are already starting to grow, and these tasty berries will start rolling in around mid July. Keep in mind that we will be selling seedlings later this spring at one of our first on-farm markets! If you're planning to have a veggie garden this year, treat yourself to some of the same exquisitely tasty, lovely, and unusual heirloom tomatoes, peppers and eggplant that we'll be growing on the farm. 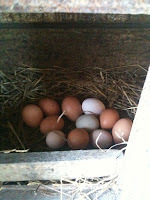 Watch the blog for more info, or email info@churchviewfarmpgh.com to add your name to our Market notification list.